Home Fashion Events NYFW SS18 Behind the Stage. New York was on fire last week for NYFW SS18. The first day kicked off with an amazing look at Indonesian Diversity with a creative group of six designers. 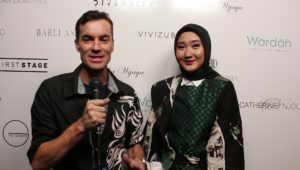 In a show themed ” Indonesian Diversity” held at The Gallery at the Dream Downtown, Dian showcased her batik hijabs collection inspired by the city of New York. Next articleNew York Fashion Week. Behind the scenes with Jack Stockton.